Sauvignon Blanc is most definitely the darling of these parts, but Pinot Gris (aka Grigio) rises in the east. This oft-watery grape most known as Italy’s Pinot Grigio (identical grape) has grown some backbone when it stakes a claim in the cooler climes. It also helps that the 2013 vintage in New Zealand has been called “the vintage of a lifetime” by many in the business. Whatever the reason, it shows in this bottle. 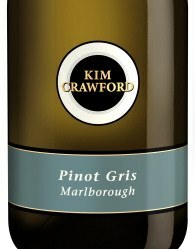 The Kim Crawford 2013 Pinot Gris offers balanced sweetness and crisp acidity, limestone minerality, Golden Delicious apples, ripe pear, herby chamomile and a lemon-honey finish. Very well made wine — and affordable — that can be enjoyed with food as well as by itself with friends and family. Food pairing: Although Pinot Noir is a favorite with blackened salmon, this Gris would pair nicely; as would Crispy Sea Bass or antipasti appetizers.